We’ve reached a milestone: episode 100! Thank you so much to all our patrons on Patreon! We hope you enjoy this very special episode and please keep a lookout for the extra special rewards we promised. We are so lucky to have this podcast and meet such wonderful dinosaur enthusiasts, and we owe it all to our listeners. On that note, in our 100th episode, we had the pleasure of speaking with Dr. Emanuel Tschopp, a postdoctoral fellow at the University of Turin in Torino, Italy, as well as the author of numerous papers, one of the most well known being A specimen-level phylogenetic analysis and taxonomic revision of Diplodocidae (Dinosauria, Sauropoda), a study published in 2015 about 81 sauropod specimens, which found Brontosaurus to be a valid genus again. You can find more of Dr. Tschopp’s work at https://www.researchgate.net/profile/Emanuel_Tschopp. Episode 100 is all about Brontosaurus, a sauropod whose name means “thunder lizard” and one of the earliest named dinosaurs that wasn’t considered to be a valid genus for about 100 years. Thank you to all our current Patreon supporters! We couldn’t have gotten this far without you! In the 1970s, John Stanton McIntosh and David Berman redescribed Diplodocus and Apatosaurus skulls, and found that Holland was right, and that Apatosaurus, and Brontosaurus, had a skull similar to Diplodocus. They also reassigned many Diplodocus skulls as Apatosaurus. Paleontologist Donald Prothero who said, “Until someone has convincingly addressed the issue, I’m going to put “Brontosaurus” in quotes and not follow the latest media fad, nor will I overrule Riggs (1903) and put the name in my books as a valid genus. In episode 67 we talk about Arlo, the Apatosaurus from Pixar’s The Good Dinosaur. Thank you to our current Patreon supporters. We love interacting with you every day! In addition to Arlo, we talked about all the special features in The Good Dinosaur, Land Before Time, and We’re Back! A Dinosaur’s Story. And we had the pleasure of talking to Chris Coulson, the owner of and dinosaur man behind Rent a Dinosaur. Learn more about Dexter, the life-sized baby T-rex, and see videos of Dexter in action on http://rentadinosaur.co.uk/ and on Facebook. You can also reach Dexter on Twitter, @rentadinosaur. Below are some amazing images of Dexter, in the process of being made and as a happy baby T-rex playing with others, that Chris was kind enough to share. Enjoy! He considered having Arlo attacked early on setting the stage for his fear, but decided that he wanted it to be more of a character trait than a one time event. They also say that when he is weak he walks a little bit more like a camel with his legs bent. Luckily for Arlo other members of the crew suggested little behavioral traits aside from just fear to add depth to his character. Like many animated characters Arlo’s eyes are much bigger than they would be on a real animal and even compared to the rest of his family. In the Good Dinosaur Arlo is shown at three ages: when he hatches, as a young child, and finally as a preteen. As he gets older his posture gets more dinosaur-like with shoulders straight down rather than a sprawling posture. It’s an interesting choice because with that diet he wouldn’t need the dental battery and large number of teeth that Apatosaurus probably had. Arlo knows how to swim, at least after learning from spot, so not surprisingly he basically swims in a doggie paddle type way. Fun fact: Fireflies or lightning bugs or more technically the family of beetles Lampyridae. The first proto-firefly may have evolved as early as 150 million years ago, and fireflies that resemble what we would see today evolved about 20 million years ago, so there was definitely a chance that Apatosaurus or at least some other dinosaurs would have seen fireflies. In episode 66, we feature a round-up of our favorite news stories from our first year of podcasting I Know Dino. This past year, we’ve learned a lot and got to connect with some amazing people. And we had tons of great interviews! Thank you to: Pete Larson, Anthony J Martin, Phil Currie, Keiron Pim, Taylor McCoy, Matt Martyniuk, Josh Cotton, Amaury Michel, Jim Kirkland, Jack Horner, Brad Jost, Saurian Team (Nick Turinetti, Henry Meyers, Bryan Phillips, Alejandra), and Christopher Lowman! “The air is warm and the ground is moist, almost spongy. Dakotaraptor steini takes slow, deliberate steps, keeping the sickle-like claws on her second toes off the ground. They are large, 9.5 in (24 cm) long, big enough to slash and kill a decent-sized meal. Dakotaraptor is scouting the area for potential prey. At 18 ft (5.5 m) long, with long legs that allow her to reach speeds of 30-40 mph (50-65 kph), she doesn’t have to worry about being attacked. Also includes a list of fun facts about each dinosaur, plus the other 25 dinosaurs named in 2015, for a total of 35 dinosaurs, and links to more resources! Dinosaurs, or more specifically sauropods, had the longest necks of any other creature that has ever lived on Earth. 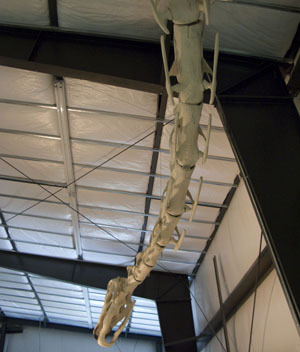 A sauropod could have a neck up to 50 feet long, six times longer than a giraffe’s neck, according to Live Science. But how did their necks get so long? Apparently, it had to do with their hollow bones. In a recent study, led by paleontologist Michael Taylor and published in PeerJ, researchers found that 60 percent of sauropod necks consisted of air, and some necks were just as light as the bones of birds. It also helped that sauropods had large torsos, stood on four legs, and had up to 19 neck vertebrae. Additionally, sauropods had heads so small they were basically just mouths—and they didn’t even have cheeks! Because of this, they didn’t chew their food; they just swallowed it. One good thing about being built like a bird is it allowed sauropods to continuously “draw fresh air through their lungs,” according to Live Science. This made it much easier to breath than if they had to breathe like mammals, meaning they would have to breathe out before breathing in again. There are a few reasons why sauropods evolved to have long necks. Maybe they needed a long neck to reach leaves on tall trees, or maybe they swept their neck from side to side to graze on grass. Another theory is that long necks attracted potential mates. In Live Science, Taylor said he and his colleagues suspected that Apatosaurus males combated each other with their necks, probably to fight over females. Apatosaurus apparently had a bifurcated neck that made them extra wide and deep.